Facebook f8 Tickets Go Up A Bit Early. Not All That Much Cheaper Than Twitter Chirp. Back in December at Le Web, Twitter announced that it would hold its first-ever conference, Chirp, in San Francisco, in 2010. About a month later, they gave out the details, including that it would be taking place exactly a week before Facebook’s big conference, f8. Seeing as both are geared towards developers, it’s pretty clear they’re gunning for one another. But it seemed that f8 would have one large advantage: ticket price. But now it appears that may not be such an advantage. The ticket page for f8 was briefly online earlier today at this URL. It appears that Facebook has since put it under password protection. But guess who was able to grab a screenshot? This guy. Notably, it appears that regular f8 tickets will be $325 this year. While that’s still about $140 cheaper (140, get it?) than Chirp, it’s not drastically cheaper, as many had been thinking. In the past, Facebook has sold tickets for $250, or even $150 if you signed up early. But, f8 still has one major price point advantage: tickets for students are only $50. When asked why tickets were so expensive to Chirp, conference organizers noted that unlike f8, Chirp wasn’t accepting outside sponsors, which f8 has used in previous years to keep costs down. It’s not clear if Facebook is doing that again this year, but judging from the ticketing page, at least Eventbrite is a partner. f8 will take place this year on April 21 and 22 at the San Francisco Design Center (same as previous years). Again, this is exactly one week after the two-day Chirp conference. We’ve reached out to Facebook about the event, and ticket prices, and will update when we hear back. 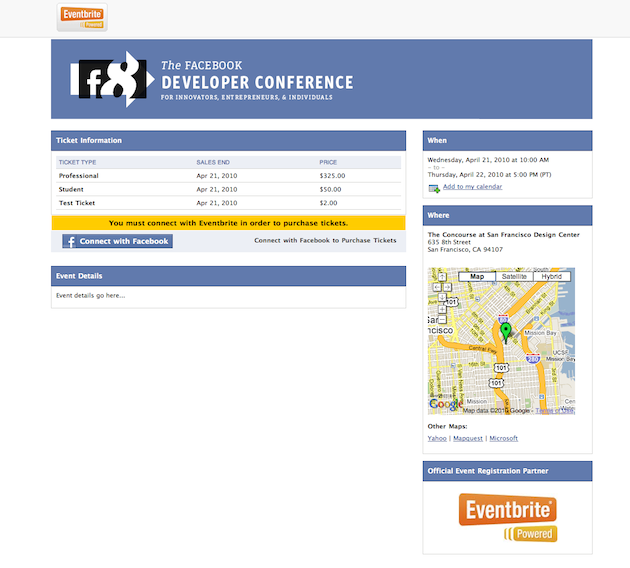 We are preparing a Facebook Connect-enabled registration page with EventBrite in anticipation for f8, and will open it in the coming weeks. Watch the f8 Page for the latest details (www.facebook.com/f8). In the past, tickets have been $150 for early bird; $50 for student; $250 for regular. So basically, it sounds like that was indeed the page, and it just went up a bit early. And yes, prices appear to be going up.